Although there are many works dealing with Pompeii and Herculaneum, none of them try to encompass the entire spectrum of material related to its reception in popular imagination. 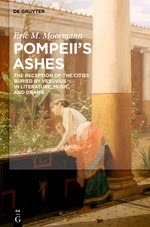 Pompeii’s Ashes surveys a broad variety of such works, ranging from travelogues between ca. 1740 and 2010 to 250 years of fiction, including stage works, music, and films. The first two chapters provide an in-depth analysis of the excavation history and an overview of the reflections of travelers. The six remaining chapters discuss several clearly-defined genres: historical novels with pagan tendencies, and those with Christians and Jews as protagonists, contemporary adventures, time traveling, mock manuscripts, and works dedicated to Vesuvius. “Pompeii’s Ashes” demonstrates how the eternal fascination with the oldest still-running archaeological projects in the world began, developed, and continue until now.